(Nanowerk News) Researchers at the Joint Quantum Institute (JQI), a collaboration of the National Institute of Standards and Technology and the University of Maryland at College Park, can speed up photons (particles of light) to seemingly faster-than-light speeds through a stack of materials by adding a single, strategically placed layer. This experimental demonstration confirms intriguing quantum-physics predictions that light’s transit time through complex multilayered materials need not depend on thickness, as it does for simple materials such as glass, but rather on the order in which the layers are stacked. This is the first published study ("Single-photon propagation through dielectric bandgaps") of this dependence with single photons. (Top) A single photon travels through alternating layers of low (blue) and high (green) refractive index material more slowly (top) or quickly (bottom) depending upon the order of the layers. A strategically placed additional layer (bottom) can dramatically reduce photon transit time. 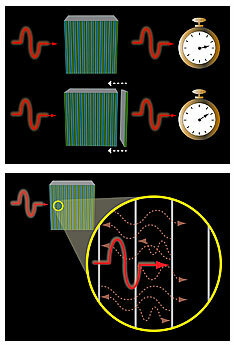 (Bottom) At the boundaries between layers, the photon creates waves interfering with each other, affecting its transit time. In a follow up to earlier experimental measurements, the JQI researchers created stacks of approximately 30 dielectric layers, each about 80 nanometers thick, equivalent to about a quarter of a wavelength of the light traveling through it. The layers alternated between high (H) and low (L) refractive index material, which cause light waves to bend or reflect by varying amounts. After a single photon hits the boundary between the H and L layers, it has a chance of being reflected or passing through. When encountering a stack of 30 layers alternating between L and H, the rare photons that completely penetrate the stack pass through in about 12.84 femtoseconds (fs, quadrillionths of a second). Adding a single low-index layer to the end of this stack disproportionately increased the photon transit time by 3.52 fs to about 16.36 fs. (The transit time through this added layer would be only about 0.58 fs, if it depended only upon the layer’s thickness and refractive index.) On the contrary, adding an extra H layer to a stack of 30 layers alternating between H and L would reduce the transit time to about 5.34 fs, so that individual photons seem to emerge through the 2.6-micron-thick stack at superluminal (faster-than-light) speeds. What the JQI researchers are seeing can be explained by the wave properties of light. In this experiment, the light begins and ends its existence acting as a particle—a photon. But when one of these photons hits a boundary between the layers of material, it creates waves at each surface, and the traveling light waves interfere with each other just as opposing ocean waves cause a riptide at the beach. With the H and L layers arranged just right, the interfering light waves combine to give rise to transmitted photons that emerge early. No faster than light speed information transfer occurs because, in actuality, it is something of an illusion: only a small proportion of photons make it through the stack, and if all the initial photons were detected, the detectors would record photons over a normal distribution of times.